what happens to Verbs when the Subject or the Verb Tense changes." What is "Let's Make Questions"? 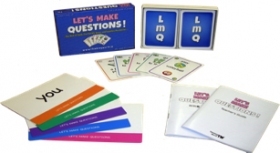 * LET'S MAKE QUESTIONS is a collection of EFL Card Games designed for students of all ages and all levels, designed to give your students a place to use the language they have already acquired or are about to acquire. * LMQ is designed to make the students think, to help the students to be creative, to become more confident when using English and have fun at the same time. * LMQ is designed to give your students the skills and the confidence to make questions, answers and statements, ranging from very basic up to very advanced, but always at the student’s current level. * LMQ is designed to help your students, with the use of Color Coded Cards, learn how to go back and forth between Present, Past and Future tenses with ease. * LMQ is designed so that you can easily introduce new grammar during gameplay and still keep the students interested and focused. * LMQ is designed to be flexible, LMQ games evolve at the same speed as the students evolve. Super Simple Songs CD - Kids Song Collection - Do You Like Broccoli Ice Cream?